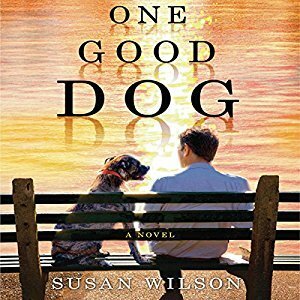 I regretfully write that I nominated One Good Dog by Susan Wilson for Richly Read's May selection. We had decided to read a book that had an animal focus. I found this one on many lists with high star ratings on Goodreads and Amazon. As an aside, I prefer not to read reviews before I write my own so my review is truly my own thoughts and opinions. Choosing a book on numerical ratings is not something I would normally do either. I think if you are a reader, you should have no problem reading a review from a fellow reader. If you are simply relying on the ratings ... shame on you! But I digress. The high quantitative praise coupled with the compelling description of the book led me to nominate it. One Good Dog is about a man, Adam March, who makes a mistake that causes his professional and personal life to plummet drastically. While attempting to rebuild and redefine himself, he performs a good deed. As a result of that deed, Adam adopts a dog (or as we animal lovers like to say: the dog adopted him). From there, the author tries her best to take us on Adam's journey to redemption. She tries. I listened to this book on audio borrowed for my local library. I am thankful I didn't purchase it. However, my disdain for the book is probably stronger because I listened to the audio version. The voices attributed to the African American characters, who were always specifically called out as African American while no other races were noted, were condescending. (It's almost as if the author was trying to satisfy some affirmative action quota for number of black people in a novel.) All of the African American characters were using this so-called "black" dialect in the audiobook. I'm sorry. Is this how all African Americans speak? No one I know talks this way. The reading and acting did nothing to further character development. Sadly, they only exacerbated very basic and condescending stereotypes of African Americans. Frankly, it angered me, and I'll likely never read another book by this author as a result. Finally, people of color were relegated to seemingly negative roles. They were dog fighters or homeless or Hurricane Katrina victims. There were no instances of African Americans who were of higher socioeconomic status or from Adam's life before his fall. I was completely disgusted by the constant comparisons of African Americans to dogs throughout the entirety of the book. In a world where African Americans have been enslaved, lynched, attacked by dogs, and gunned down like animals, the racist overtones only contribute to an unrealistic image of black people. I first sensed a hint of racism when one of the dogs was named "Fiddy" as in the rapper, 50 cent. Later, when Adam is trying to decide what to name Chance, his friend suggests Cassius as in Clay or George as in Foreman. The late, great Muhammad Ali has not used the moniker Cassius Clay since 1964. Why black athletes and a rapper as dog names? Are there no professional boxers of other ethnicities? Why not call the dog Rocky? It is ironic and unfortunate that Wilson wrote her protagonist as struggling not to be viewed or defined by one major life event, but she was completely OK creating one dimensional African American characters. On top of the racial overtones, the foul language in the book was overused and added no depth to the story. If you're wondering why my review seems to focus so much on the racial aspect, it is because Wilson did as much in her writing as I in my reviewing. Recommendation: I gave this two stars because I'm a dog lover. It probably deserves one. Regardless of what Garth Stein says about this book (he seemed to endorse it), I'm telling you, if you want to read an emotional book about a dog, pick up The Art of Racing in the Rain. Until next time ... Read on! Hello! Thanks for visiting my blog. I am an avid reader who enjoys reading fiction. I also read biographies as well as fiction and non-fiction books about the Holocaust and Civil Rights period ... and I've been known to read a blog or two! If you'd like me to review a book, please complete the contact form below my bio. I'll be in touch! Share book reviews and ratings with Melyssa, and even join a book club on Goodreads. Share book reviews and ratings with The Black Bookcase, and even join a book club on Goodreads. We are a group of black women who love to read, want to read more and meet like-minded women. Share book reviews and ratings with Mocha Girls Read, and even join a book club on Goodreads. This can include genre fiction that is literary (e.g. speculative fiction, historical fiction, etc. ), as long as it's written by a person of color (African-American, Asian-American, Latino/a, Native American, Middle Eastern). Share book reviews and ratings with Literary Fiction by People of Color, and even join a book club on Goodreads. This group focuses on books written by or about African-Americans in many different genres though we focus on historical fiction and classics. Share book reviews and ratings with African-American Historical Fiction, and even join a book club on Goodreads. My name is Melyssa, and I love books. I love reading books. I love browsing coffee table picture books. I love coloring books. I love eBooks. And I most recently started loving audiobooks. Most of my free time is spent reading fiction, and this is the space where I share my thoughts, opinions and words on what I've recently read.